Datça Almond Blossom Festival, which brings color to winter days, is scheduled to take place next month. In the weeks to come, some of Turkey's most picturesque and popular holiday towns will be brought to life with the country's most beloved food and cultural festivals celebrating bountiful harvests. These festivals, held with the aim of reviving cultural values and preserving them for future generations, is an opportune occasion to discover some of the most in-demand destinations in Turkey, during the off-season. The beautiful Datça peninsula is getting ready to host the first-ever Datça Almond Blossom Festival (Datça Badem Çiçeği Festivali), which will take place from Feb. 8 to 10. For three full days there will be stands selling all sorts of almond-related products, dishes and gifts, while a full program of workshops, seminars, dance and musical performances takes place on the sidelines. Set to be in a league of its own, this harvest festival will also have POI workshops, fire-dancing and DJs performing each day. In addition, there will also be photography tours and nature walking tours of the ruins of ancient Datça and Knidos. 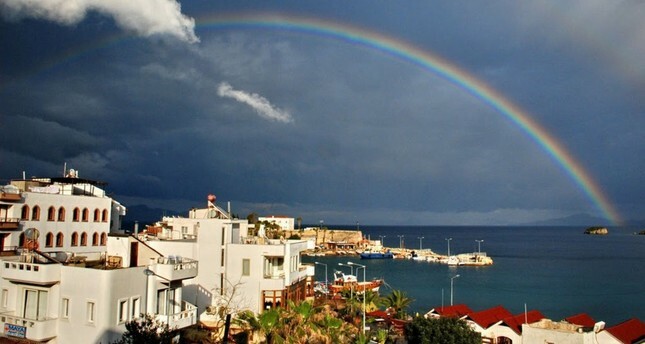 Over the weekend of March 9 and 10, the town of Ortakent in Bodrum will host the Bodrum Bitter Greens Festival (Bodrum Acı Ot Festivali), which will showcase the wild greens and their culinary traditions that the Aegean area is famous for. This now annual festival, which began last year seems here to stay as for two whole days, the streets in the center of the village of Ortakent will be lined with stands presenting dishes made by restaurants and local chefs showcasing wild greens as well as seminars, musical performances and traditional folklore dancing. Hands down one of the most popular harvest festivals in the country, nearly a million people will be flocking to the tenth Alaçatı Herb Festival, which will take place from April 5 to 8. This popular summer hotspot is famed for its windsurfing beach and quaint cobblestone town with historic stone homes that have been transformed into the chicest boutique hotels and restaurants in Turkey. During the Alaçatı Herb Festival, the streets are lined with stalls presenting a wide variety of herb-based dishes; there are also seminars and video screenings on the herbs' beneficial properties, workshops on how to collect them and cooking classes on how to prepare them. Other highlights include a parade, wild green gathering excursions and cooking competitions. Going into its eleventh year, Fethiye's Yeşilüzümlü Morel Mushroom Festival (Yeşilüzümlü Kuzugöbeği Festivali) is gaining popularity as thousands make their way to the rural and picturesque Yeşilüzümlü village, located 16 kilometers from the city center and at 700 meters elevation. A Slow Food town candidate, every year the prized wild morel mushroom is celebrated and showcased in weekend-long festivities. There will be stands displaying all sorts of mushroom products and dishes prepared with them. There will be panels discussing mushroom-related topics and a guided mushroom hunt. The festival always closes with a live concert by one of Turkey's top-billed musical performers. It will take place from April 5 to 7. Turkey's first and only carnival of its kind, the International Orange Blossom Carnival in Adana will take place from April 3 to 7. In addition to the colorful carnival parade, which will take place on April 6, throughout the five-day festivities, there will be street performances, dance shows, musical concerts, competitions and stands selling local products from the region. Located between Alaçatı and the city of İzmir, Urla is also a quaint Aegean summer destination town that comes to life in the last weekend of April, from the 26th to the 28th, for the Artichoke Festival. For three days, this Aegean town transforms into a culinary, educational and visual wonderland with its cobblestone streets lined with stalls presenting dishes, workshops, panels and cooking courses all centered on the beloved artichoke. This will be the fifth edition of this festival in which approximately 100,000 people come out from all over Turkey and the world to enjoy three days of merriment centered on cuisine and farm-to-table production in this beautiful town. Bodrum's Slow Food chapter Yaveş Gari hosts a cheese festival that has taken place every other year since 2015 - theSlow Cheese Bodrum Peynir Festivali. This year, which is the third edition, will take place between April 11 and 14 in different venues in Bodrum and Muğla. A celebration of regional Anatolian cheeses, there will be tastings of cheeses from all over Turkey as well as cheese-making workshops and seminars on topics related to cheese production.